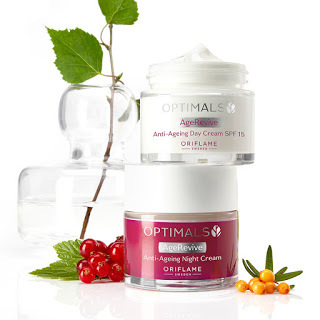 Optimals is one of the most appreciated and most successful face care ranges in the world. Now, Oriflame relaunches the range with new lines that meet all the care needs of the face. Nature allied to science, for healthy and beautiful skin! With a unique combination of Swedish natural ingredients, the new Optimals range offers solutions to your specific skin needs. The vast Swedish nature and abundant marine environment boast many of the world’s toughest plants. In both environments plants are subjected to the rigorous climate, and their survival is dependent on their concentrations rich in antioxidants, vitamins and essential oils. It is this rich composition that makes them highly effective and beneficial to the skin. For over 50 years , Oriflame scientists have turned to Swedish nature for inspiration and have used their extensive knowledge to identify specific plants and benefit from their individual benefits to the skin. Based on this experience, Oriflame carefully selected some of the most effective Swedish plants and combined them, using current scientific techniques . The result is a range with unique combinations of Swedish natural ingredients, which form the basis of the new Optimals. Each line is a specific solution for specific skin needs, helping to achieve the optimal balance between nutrition and effectiveness that naturally beautiful skin requires and deserves. All Optimals products contain a combination of Swedish natural ingredients carefully selected for their skin benefits. By combining natural ingredients into unique formulas, we have created products to meet specific skin needs such as moisturizing, skin tone enhancement and antiaging. Over 50 years, we have turned to Swedish nature for inspiration. The Skin Research Institute in Stockholm is dedicated to the research of advanced face care, always inspired by the power of Swedish ingredients. How does Optimals differ from NovAge? NovAge is our most advanced and scientific face care range. This is a range based on the most innovative science, with proven results through clinical studies, and powered by advanced technologies and extracts of plant stem cells. This is a premium range that is at the level of the best and most effective ranges in the cosmetic / dermocosmetic market. On the other hand, Optimals offers its customers a simpler approach to face care. This is a range of face care with lines enhanced with combinations of Swedish natural ingredients. These combinations were combined based on our vast experience, and contain some of the best-known Swedish plants. In short, nature allied with science. Optimals is designed for those who want a simpler approach to face care for women who want a naturally beautiful skin and a simple but effective face care routine.